We now understand how vibrations work, due to physics. We’re no longer confused by the fact that plucking a guitar string somehow gives rise to order and music. It’s time we do the same thing for the fluctuations in what we know as well, and recognize that there’s an order to all of our changing knowledge. This book is a guide to the science behind the vibrations in the facts around us. If you know anything about science, you’ll know that scientific knowledge is provisional. Pluto is no longer classified as a planet, the health benefits of red wine seem to magically fluctuate, and smoking was once recommended by doctors as a healthy practice. These changes can frustrate people, and they can give rise to the worrying idea that scientists are just making it up as they go along, that nothing is reliable anyway, and that science is so broken we might as well dismiss it altogether. Perhaps the best way to describe The Half Life of Facts is as the Freakonomics of the scientific method. Arbesman brings together an impressive range of knowledge to explain how facts evolve, and he does so in a way that is both detailed and accessible and that never fails to be completely engaging. Along the way, he covers topics such as the pace of scientific discovery, how information spreads across networks of social contacts, why erroneous facts are so resilient to correction, the role human error plays in science, etc. 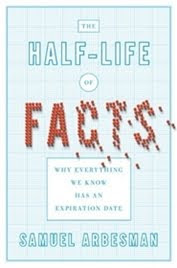 The Half Life of Facts is obviously a science-positive book, and I really appreciated that aspect of it. But more than as a science fan, I absolutely loved it as a library science graduate. The ground Arbesman covers has huge implications for information science: how do those of us in the business of helping others navigate the wealth of information out there cope with these changes? How do we make sure that potential life-saving knowledge isn’t buried under everything else that we know? How do we keep facts visible, how do we link them, how do we get them to the people who could use them the most? Imagine that in one area of the scientific literature there was a paper showing that A implies B. Then, somewhere else, in some seldom- read journal (or even a journal only read by those in an entirely different area), an article contained the finding that B implies C. But since no one has read both papers, the obvious result—that A implies C—remained dormant, hidden in the literature as an unknown fact. This inability to combine recent research with other findings can make it less useful than it could be, and the result is that everyone misses out. Hidden public knowledge can also lead to several people independently rediscovering things that have been known in other fields for a long time, which wastes time, resources, and intellectual energy that could be put to use elsewhere. It’s one thing to be told that a food is healthy one day and a carcinogen the next. But it’s something else entirely to assume that basic tenets of our scientific framework—gravity, genetics, electromagnetism—might very well be wrong and can possibly be part of the half-life of knowledge. But this is not the way science works. While portions of our current state of science can be overturned, this occurs only in the service of something much more positive: an approach to scientific truth. Here’s a good reason to resent captcha a little less. Who knew? Simple tasks are given to lots of people to perform, often either for a small amount of money or because someone has cleverly hidden the task in a game. One of the most well-known examples of these are the distorted words we often have to read correctly in order to prove our humanity to a Web site. Rather than simply being an inconvenience, they are now being exploited to actually help digitize such works as the New York Times archives. By pairing a distorted known word with one that computers are unable to decipher, everyday users who can read these words are helping bring newspapers and books into digital formats. There are many examples where a small error, despite being corrected later, has spread through a population. If you want to spend days poring over persistent errors that have spread far and wide, Snopes. com is a great font for these bits of information. Or even look at Wikipedia. In his delightfully nerdy Web comic xkcd, author Randall Munroe wishes for a world in which schoolchildren read the Wikipedia page on common misconceptions weekly, in order to learn truth as well as skepticism. Both of these sites are full of urban legends, false facts, and misconceptions that have become prevalent. One good rule of thumb when examining how errors propagate over time is to look for a simple phrase: “contrary to popular belief.” While the phrase is a favorite of writers with a love for the counterintuitive point (and this author is not immune to this), it’s also a clear indication that a bit of knowledge has spread far and wide despite being inaccurate. The antidote to this false fact, which of course the writer is about to tell you, has yet to penetrate the popular consciousness. And this phrase is by no means new. I have found instances of it in books and magazines from the nineteenth century debunking false facts about lunar phases, medical knowledge, and even the heredity of genius. Clearly, science is not an abstract venture that is done in isolation from everyday human issues. It is not some endeavor immune from passions and biases. Science is an entirely human process. Science is done through hunches and chance recognition of relationships, and is enriched by spirited discussion and debate around the lab. But science is also subject to our baser instincts. Data are hoarded, scientists refuse to collaborate, and grudges can play a role in peer review. The human aspect of science plays an important role when it comes to the acceptance of new knowledge. We don’t always weigh the evidence for and against a new discovery or theory and then make our decision, especially if it requires a wholesale overhaul of our scientific worldview. Too often we are dragged, spouting alternative theories and contradictory data, to the new theoretical viewpoint. This can be very good. Having more than a few contrarians keeps everyone honest. But it can also be very bad, as when Semmelweis was ignored and essentially driven mad by his colleagues’ refusal to accept the truth. But eventually, in the face of overwhelming evidence, the majority will generally accept the new theory, before their recalcitrance becomes too counterproductive. The Half-Life of Facts is a book I put at the top of my TBR list right after I read the first paragraph! I've wondered for years why coffee is suddenly good for you then very bad for you with related arguments for the health benefits of caffeine followed by advocates who insist we drink decaf coffee to avoid health risks! Thank you Samuel Arbesman for saving my sanity! The info about captcha is fascinating! I will resent it less, for a little while anyway. This sounds really good to me too - I'm adding it to my TBR list. I even think it's something that my husband and I would both like, and books like that are not too common. Must get this book. But I have to admit I'm still going to hate captcha. Howard Sherman: And mine! I really liked how optimistic and non-alarmist his tone was. Kathy: I suspect it won't last long for me either :P I wish I knew which sites do it, so I could know when to feel useful. Kelly and Meghan: I hope you both enjoy it if you decide to pick it up! Debi: Well, I won't suddenly start liking it either, but at least now we know it's doing some good :P You and Rich will both love this! So maybe my brain is tired, but I don't get it. What's the problem with the phrase "contrary to popular belief"? and I don't understand the bit about captcha- how exactly does that help newspapers get digitized? someone please explain! Regardless, the book sounds fascinating but I'm afraid I might not understand it all! This sounds very interesting, I might get to it if I actually read again someday. And I also think it's something that my husband would like. In the meantime, I'm going right away to Wikipedia's page on common misconceptions, I love these little stories! As for "contrary to popular belief", there's nothing wrong with it at all - it's just that it's a good marker of something that is widely believed to be true, but isn't. It's a phrase that people are likely to use before they go on to debunk something, so if you're curious as to which common sense ideas are in fact factually wrong, you could try googling the phrase and see what you find. I've yet to put this into practice myself, but I bet it will be illuminating! Larissa: Me too - I could read them for hours! Anna- thanks for clearing that up! I find the print-unscrambling thing fascinating now. What a clever way to use a tool most people find annoying for something actually productive! Wow. So Captcha isn't the devil after, all? ha! This sounds to be a very interesting read. "But more than as a science fan, I absolutely loved it as a library science graduate." Aaaand... sold. Now I must find myself a copy. I'm also glad that you say it has an optimistic tone; at this point in my life, I tend to engage better with nonfiction that doesn't read like an alarm or a doom. 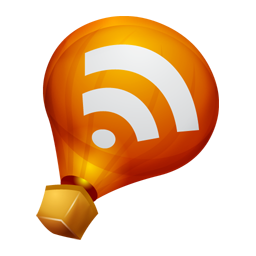 Rachel: Thanks for your link - added! That's so cool that you got to see his TED talk. I'll have to watch the video one of these days. Kiirstin: Yes, same here. I do appreciate certain non-fiction books that draw attention to things their authors have good reasons to be angry about, but reading something so unapologetically hopeful was nice for a change. This sounds very interesting and a little bit over my head.